For the dressing- In a small bowl whisk together mayonnaise, lemon juice, mustard, Worcestershire sauce, and minced anchovy. Then last whisk in olive oil. Refrigerate until needed (whisk once before using). For the croutons- Preheat the oven to 350 degrees. Tear or cut bread into pieces and place in a bowl. In a small bowl mix crushed garlic, olive oil, and salt. Drizzle oil mixture over bread pieces and toss to coat. Lie out bread pieces in a single layer on a baking sheet and bake for 15 minutes turning half way through for even browning. Allow to cool until needed. For the chicken- Between 2 sheets of wax paper pound chicken breasts with a mallet until at an even thickness. Season chicken breasts on both sides with salt, sugar, garlic powder and onion powder. Grill chicken on an outdoor grill or indoor grill pan for 5 minutes on each side of until no longer pink inside. 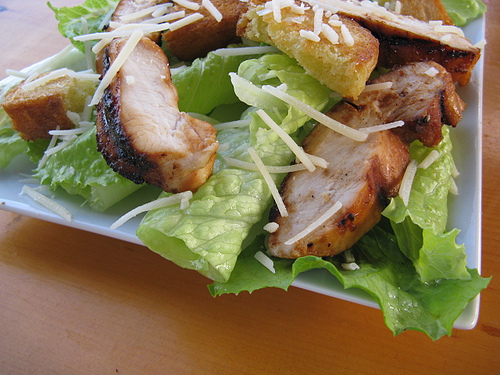 Slice chicken into small strips. To make the salad mix shredded lettuce and chicken bits. 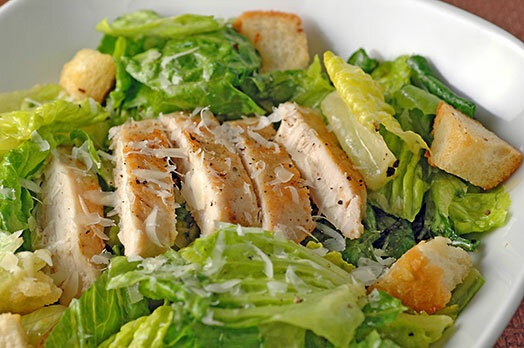 Top with croutons, dressing and shredded parmesan cheese.